All right. It's true. The cold winds of the economy, nature, and politics are blowing through the country like an out-of-control winter's hurricane. But while public servants might threaten to strike again; while flood waters might be burying houses, farms, and entire villages in the west under ten feet of water; while the government might be readying an early-December budget that's going to blow us all to hell and back; everyone who lives here has a little secret. Christmas is just around the corner. And we're all looking forward to it, let me tell you. So What's Special About an Irish Christmas? If you're Christian, or just like the spirit of the season, we all know that Christmas is celebrated in just about every country in this crazy world of ours. But an Irish Christmas is...well...a little different. I received my indoctrination to an Irish Christmas in December of 1982. I'm not sure what I was expecting, but it wasn't exactly what occurred. I'll start with the economics of the times: back then, in '82, I was almost penniless. But then the entire country was broke too, so I didn't feel unusual. My good wife Bernie and I counted out the small stipend that I'd received from my miserly employer of the time, and went into the town of Navan to go Christmas shopping. In those days, the town's shopping district was quite small: a main street filled with assorted shops, chippers, and any number of pubs; and a tiny 'shopping centre' that even had a Penney's. We went wild! As I remember, I was able to purchase a pair of gloves and hat for Bernie (as I remember, she bought me the same), a doll's crib for our daughter, a small turkey and ham for the dinner (together with sprouts, potatoes, and bread); and a small bottle of whiskey to cheer the night away. Materially, it wasn't much of a Christmas. But that's before the good stuff started. Christmas Eve in Ireland is quite unlike any other Christmas Eve I've experienced anywhere else in the world. That evening, my brother in law invited me out for a couple of pints of the black stuff. We wiled away an hour or so in the packed pub, exchanging Christmas greetings with the locals, before staggering through the crisp starry night and to the warmth of my house. There, a local priest was waiting, having barged in for a night cap before Christmas Eve mass. I must admit that I was staggered by the many times he went at the small bottle of Jamieson, and reckoned that he'd get through Midnight Mass with nary a care in the world. After he left, my good wife and I wrapped up tight, put our child in her pram, and took a walk into the town. In those days, outdoor Christmas lights were foreign to this country. Instead, the warming glow of a single candle lit the window of every home, welcoming the Christ child once again into the world. It was an amazingly serene time: the frost covered streets were empty, not only due to the fact that so few people had cars back then, but because those that did were invariably home celebrating the season with their families. Through the small windows of the houses, we could make out parents putting secret lumpy packages beneath their simple trees. Few people then bothered with boxes to make their Christmas perfect. Instead, they would wrap up parcels any old way; dolls arms, toy rifle barrels, the heads of golf sticks would stick out every which way, as if Santa had been so busy that he simply didn't have time to do anything else. We walked through the town and into the Church. There, our local priest - possibly feeling a bit better for it all because of the Jamieson that we'd proferred- celebrated Midnight Mass with his congregation. The Church was cold and dark, lit only by the candles on the alter and the Christmas lights that glowed warm upon the face of an infant Jesu hiding in his manger. For a moment, and despite the few hundred town's people that sat around me, I felt one of them, content in the knowledge that I'd at last found a place to call home. Later, and after Mass, we wandered up to my wife's parent's house. There, my mother-in-law Kathleen had sandwiches waiting: thick slices of fresh ham nestled between white bread, slathered with hot Coleman's mustard. My father-in-law Luke handed us not only a cup of tea but a pint bottle of Guinness too. And for awhile, we sat around the coal fire that sparked and sighed and bathed the small living room in ghostly shadow. We whittled away some time with Luke telling ghost stories of the Banshee, and the time as a young man and he walked through the door to find a neighbor hanging by his neck. In Ireland, Christmas is also a time of ghostly tales, and so it was that night. And finally we left, walking again through the clear starry night, accompanies by the glow of candles, and to our own home and its warming Christmas Candle. Christmas here has changed so very much over the years. As the country has grown richer, the pile of material packages under the Christmas tree have also grown. Now, deep in recession, perhaps once again we'll learn to understand the true spirit of an Irish Christmas: a time of starry nights, and simple Christmas Trees. A time of empty, frosty streets and the warmth of family and fellowship. 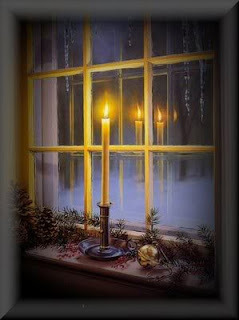 A time of candles alight in windows, to warmly welcome friends. Sigh. What a genuinely lovely Christmas. Simple and soul soothing. What we lost to prosperity. I hope you can recapture some of that this year. I know I shall try. Great blog and this best flag very useful to everyone. I like your travel blog here. I have one as well which I hope to be a good resource for those looking to go on vacation. I'd like to exchange links with you and help spread some traffic around. Oh, this blog is just what I needed for some background on irish traditions for a story. Thank you for sharing with us! Great Narration, Its good that your blog is a comment you back blog. Thank you for sharing with us!